I absolutely love a good primer, and I fell deeply in love with this one! I opted for the anti-dull skin colour balance from their collection and it does exactly what it says on the tin (or tube). The purple primer can be applied so smoothly, making the skin feel and look smoother and more radiant. It gives a great base to foundation and keeps it stuck all day. One word. Life-changing. Is there anything more to make you feel empowered daily than a strong brow game. This is the only brow product you will ever need. It took me a while to establish how much product is actually needed for your brows- because it turns out, you only need the tiniest bit. Once you’re comfortable with using it, it’s fantastic. I purchased the Dark Brown shade, and the match is spot on. This is a great concealer for predominately under the eyes. It really lifts the eye under the lower lashes and gives a great base for foundation. I’ve noticed I’ve even used less foundation around my eyes as it’s not needed. I opted for the colour ‘light 02’, although I feel like I may go for 01 for my next purchase. I found this little beauty snuck away in some draws, and although it is a bronzer, look at that highlight on the bottom. 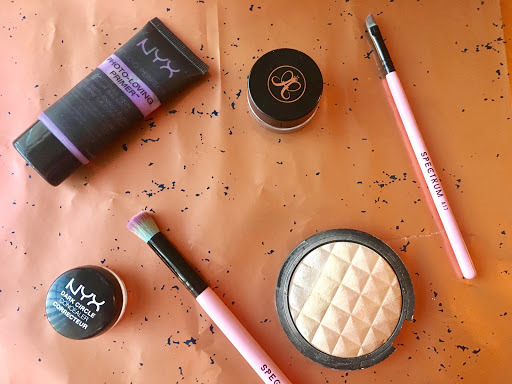 The texture and glow on it is a great companion to my foundation and blusher- I’ve had quite a few compliments from using this highlighter. I also find the texture easy to apply that quite a lot of similar highlighters.